Born in 1619 to a prominent butcher, Sir Jeffery Hudson became a valued member of Charles I's court in England — this despite being a dwarf who measured under three feet tall. And remarkably, his life contained some indisputable Game of Thrones-like action and intrigue. Writing in History Today, C. Northcote Parkinson describes the life and times of this largely unknown individual. Historians believe that his father was reasonably respected and prosperous, a butcher who served the Duke. When Hudson was a child, his height measured just under 18 inches, but he was “wholly proportionate.’ As Parkinson explains, dwarfs can be divided into two categories: proportionate and disproportionate, the latter being divided into achondroplasiac and rachitic. The actor who plays Tyrion Lannister, Peter Dinklage, was born with achondroplasia — a genetic condition characterized by a disproportionately large skull, a very round face, a relatively normal trunk, but with legs and arms short in comparison. Hudson, on the other hand, was a proportionate dwarf, or what is sometimes referred to as a midget — a person with normal proportions but who has an abnormally short stature. The term ‘dwarf,’ however, was used back in the 17th century to describe both conditions. 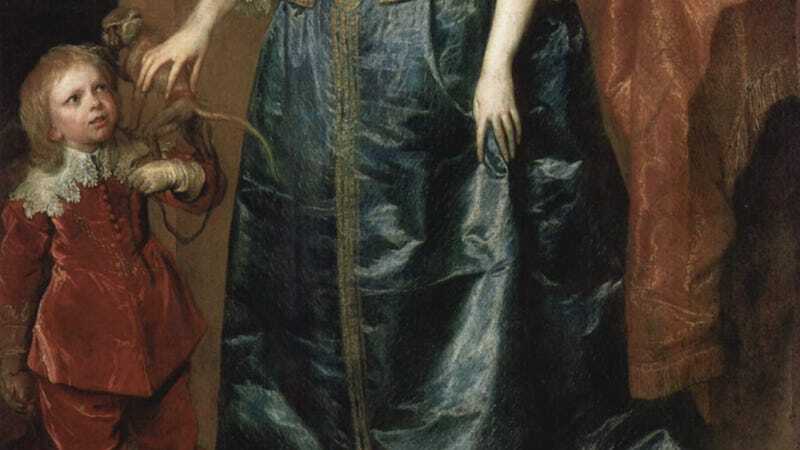 Image: Queen Henrietta Maria with Sir Jeffrey Hudson by Van Dyck. Jeffery was popular in the court, ‘wanting nothing but humility.’ He was given a number of important tasks, including one in which he was sent to fetch Madame Peronne, the Queen's midwife, from France. But his ship was taken by a privateer and the midwife arrived too late for the birth. A gentleman of the household, Mr Croft, lost no time in provoking the dwarf to challenge him: a duel, only meant for fun, was arranged in the park at Nevers. Croft and the dwarf were to meet on horseback, armed with pistols. The gibing cavalier took no fire-arms, but merely a huge squirt, with which he meant at once to extinguish his small adversary, and the powder of his weapon. The vengeful dwarf, however, managed his good steed with sufficient address to avoid the shower aimed at himself and his loaded pistols, and, withal, to shoot his laughing adversary dead. How could a midget fire a pistol without being knocked senseless by the recoil? Did he ride a horse or a Shetland pony? Did the seconds really allow Croft to appear unarmed? Of one thing we may be certain, that Jeffery must have presented an almost impossible target to his opponent. Be that as it may, Croft (Lord Croft’s brother) was certainly killed, and Jeffery was certainly in disgrace, though not imprisoned. We hear no more of him for a number of years. The story goes that he was captured off the French coast by a Turkish pirate and spent some years as a slave in Barbary. After reaching the age of thirty (in 1649), he started to grow and so reached his final height of three foot nine inches. Redeemed - we are not told how - he would seem to have been back in England by 1658, the year in which he is mentioned in Robert Heath’s Clarastella. In 1660 Charles II was restored to his throne, and Jeffery might have expected a renewal of royal protection. It would seem that he was disappointed. What did he do, and how did he live? He went back, presumably, to the Oakham neighbourhood, where he must have had relatives, and where he still had the patronage of the Villiers family. Charles II would seem to have taken no great interest in him: but he came to London in 1679 and was somehow involved in the Popish Plot, being lodged for a while in the Gatehouse Prison. Described as ‘Captain’, he received money from the Secret Service Fund in 1680 and 1681, and finally died in 1682. There is here a hint of his being useful as a secret agent or spy. Holy crap, that is an unbelievably intense life for someone who would have been as conspicuous as Jeffery. There’s much more to this story over at History Today, so be sure to check it out.